The best motorcycle tire deals can be found online. We recommend shopping tires at Rocky Mountain (2 Day Delivery) and Revzilla (7 Day Delivery) for the lowest prices, best selection and free shipping with minimum $75 orders. MotoTireGuy has a very limited stock of new tires on-hand for last minute needs. 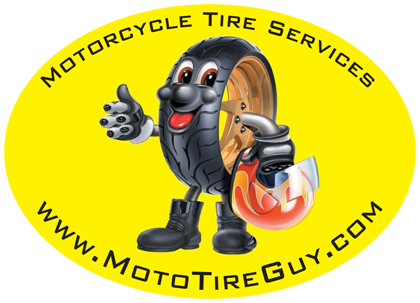 Customers are welcome to have their tires shipped direct to the MotoTireGuy workshop where we provide the professional install service. Please format the ship-to info with your Name/Phone + this address. You will be contacted when your tires arrive to discuss install scheduling. Motorcycle tires are installed and balanced while you wait. We have 14+ years and 14,000+ tires of experience installing and servicing motorcycle tires. We use the No-Mar Classic motorcycle tire changer and static wheel balance stand. We have earned all 5-Star Google/Yelp business reviews so you can trust we will treat you and your motorcycle right. Please call, email or text MotoTireGuy for assistance with ordering the correct tires/sizes for your bike or to schedule service. Service hours available Monday thru Friday 10am-6pm and Saturday noon-6pm. Appointments preferred. * Exceptions/Limitations: Apologies but we do not offer ride-in tire service for Harley-Davidson, Buell, X-large cruiser/bagger, full dresser bikes, scooters and older pre-1985 model motorcycles but we can offer carry-in service of these wheels. Apologies but no wheels with rim/bead locks or x-large 200 plus size rear tires. We reserve the right to decline service on any wheel/tire/bike for any reason. As mentioned above we recommend shopping and buying tires from major online sources such as: Rocky Mountain (Utah - 2 Day Delivery) or Revzilla (7 Day Delivery). Alternative tire sources like Cycle Gear, Amazon, Ebay and Craigslist sometimes offer good new or used motorcycle tire bargains. If buying used tires be very skeptical as you might be tricked into buying some very old or worn out junk. Provided by top web analytics analytics company.